With a 5th place finish, the 2007 All Africa games was one of Kenya's greatest ever performances in a continental basketball tourney. 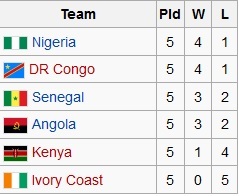 Wins over perrenial giants like Tunisia DR Congo and Algeria made it the most memorable tournament for Kenya fans. This was Kenya's finiest ever performance in any basketball tournament. They reached the final before loosing to hosts Senegal. This page has details of Kenya's performance at the 1993 FIBA Africa womens basketball championships. Despite loosing all but one of their games, the Kenya women gave a good account of themselves with respectable scores in each game. As a team, Kenya led the entire tournament in steals per game with 12.1 and were 3rd in rebounds, which is a sign of their raw talent and athletiscism . Rose Ouma was second in the tournament in assists with 4.1 apg. Caroline Achieng led the tournament in steals with 3.0 spg.